Mechanochemical processing is a novel and cost effective method of producing a wide range of nanopowders. It involves the use of a high energy ball mill to initiate chemical reactions and structural changes. 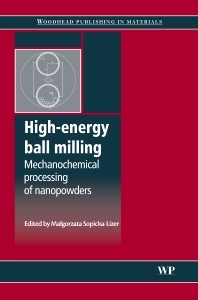 High energy ball milling: Mechanochemical processing of nanopowders reviews the latest techniques in mechanochemistry and how they can be applied to the synthesis and processing of various high-tech materials. Part one discusses the basic science of mechanochemistry with chapters on such topics as the mechanism and kinetics of mechanochemical processes, kinetic behaviour in mechanochemically-induced structural and chemical transformations and materials design through mechanochemical processing. Part two reviews mechanochemical treatment of different materials including synthesis of complex ceramic oxides, production of intermetallic compound powders, synthesis of organic compounds, synthesis of metallic-ceramic composite powders and activation of covalent bond-based materials. Part three covers mechanochemical processes in metal powder systems and other applications with coverage of topics such as plating and surface modification using ultrasonic vibrations, activated powders as precursors for spark plasma sintering, titanium dioxide photocatalyst synthesis by mechanochemical doping and synthesis of materials for lithium-ion batteries. Introduction to mechanochemical processing. Part 1 Basic science of mechanochemistry: Mechanism and kinetics of mechanochemical processes; Kinetic behaviour in mechanochemically induced structural and chemical transformations; Materials design through mechanochemical processing; Kinetic processes and mechanisms of mechanochemical alloying. Part 2 Mechanochemical treatment of different materials: Mechanochemical synthesis of complex ceramic oxides; Production of intermetallic compound powders by a mechanochemical approach: Solid-liquid reaction ball milling; Mechanochemical processing of non-oxide systems with highly covalent bonds; Mechanochemical synthesis of metallic-ceramic composite powders; Mechanochemical synthesis of organic compounds and rapidly soluble materials. Part 3 Mechanochemical processes in metal powder systems and other applications: Mechanochemical plating and surface modification using ultrasonic vibrations; Mechanochemically activated powders as precursors for spark plasma sintering (SPS) processes; Synthesis of titanium dioxide-based, visible-light induced photocatalysts by mechanochemical doping; Soft mechanochemical synthesis of materials for lithium-ion batteries: Principles and applications; Materials for lithium-ion batteries by mechanochemical methods. Dr Ma?gorzata Sopicka-Lizer is a lecturer at the Faculty of Materials Engineering and Metallurgy, Silesian University of Technology (Politechnika Slaska), Gliwice, Poland.